British Prime Minister Theresa May is still trying to find a way for her country to leave the European Union with a divorce deal. But why is breaking up so hard to do? 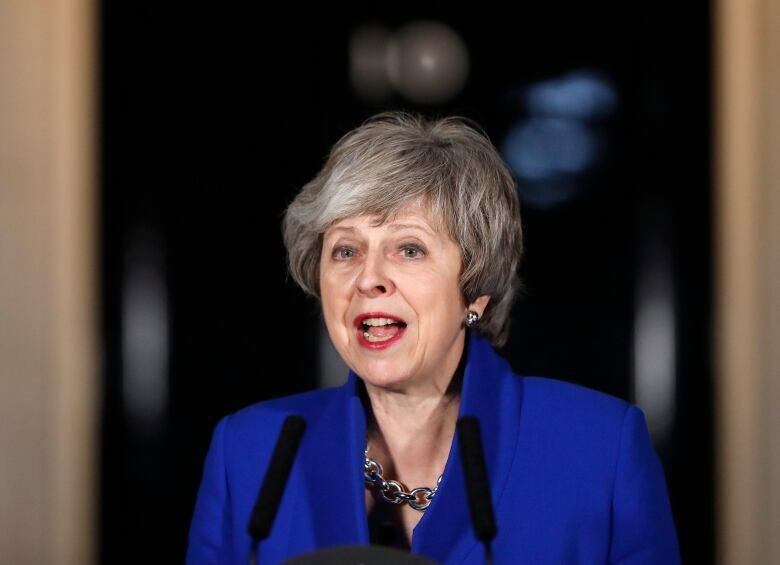 For the first time, British Prime Minister Theresa May has cleared a path for the United Kingdom's exit from the European Union to be delayed past March 29, Brexit day. The opposition, meanwhile, has started laying the groundwork for a second referendum that could cancel Brexit altogether. But didn't Britons vote to leave in the first place? Why is it taking so long? CBC explains. While a slim majority of voters (52 per cent) chose "Leave" in Britain's 2016 EU referendum, no one seems to agree on how the country should proceed. 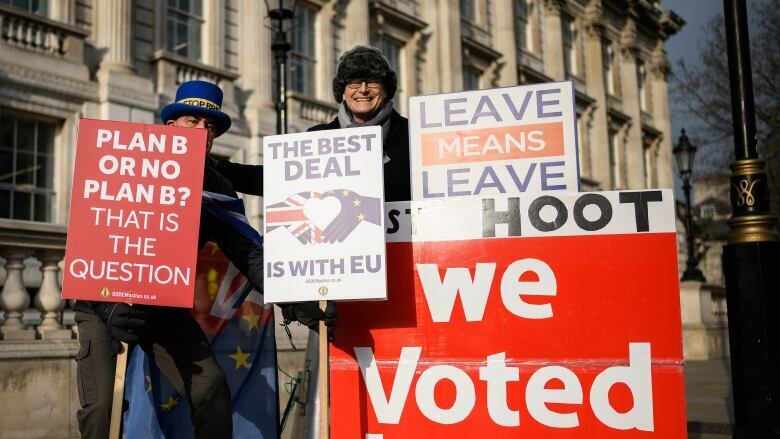 Brexit day, March 29, is enshrined in law, but barrelling toward the exit without an EU divorce deal risks damaging economies on both sides of the English Channel. The British prime minister would prefer an orderly departure with the terms set out in her EU withdrawal agreement. MPs, however, rejected that plan by a historic margin on Jan. 15. May has been trying to get EU leaders to agree to concessions on the Northern Ireland backstop (see below) to appease the hardline Brexit wing of her Conservative Party and help get her divorce deal approved. But the U.K. leader's European counterparts have shown very little interest in making significant changes to the agreement, and there's still no guarantee MPs will ratify any deal May puts to them in March. Until now, that could have raised the likelihood of a chaotic "no-deal" departure, but rejecting the agreement now appears more likely to signal a Brexit delay. On Tuesday, May told MPs if they don't approve her Brexit deal in a vote set to take place by March 12, they'll be required to vote once or twice more. 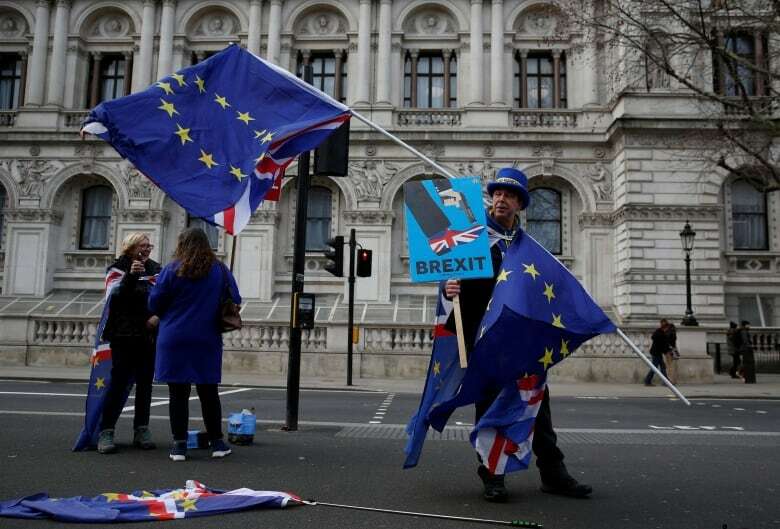 The House of Commons would first be asked whether to back a "no-deal" Brexit and, if that fails, MPs would vote on postponing Britain's EU breakup. All three votes would be done by March 14, just two weeks before the U.K. is officially scheduled to leave. "Let me be clear," May said, "I do not want to see Article 50 extended," referring to the formal two-year process by which an EU member state quits the 28-member bloc. "Our absolute focus should be on working to get a deal and leaving on March 29." Hardline Brexit-supporting Tories and opposition MPs could still be tempted to vote down May's deal for a second time. However, it's widely believed only a minority in the House would be willing to explicitly endorse the uncertainty associated with a no-deal exit. Faced with the prospect of a months-long Brexit postponement — after telling Britons for two years the country would leave March 29 — Brexiteers may be willing to swallow their pride and support the prime minister's deal, even though it represents a "softer" Brexit than they would have wanted. Then again, even if MPs finally approve the withdrawal agreement on March 12, it doesn't appear likely both houses of Parliament would then have enough time to enshrine it in law. That could result in a short Brexit delay anyway. What happens if it's delayed? Even if MPs vote to postpone Brexit, it does not automatically happen. It would only empower the prime minister make the request to her European counterparts. All 27 other EU member states would need to approve the extension of the Article 50 process, which is only designed to last for two years and expire March 29. "The House should be clear that a short extension — not beyond the end of June — would almost certainly have to be a one-off," May told MPs on Tuesday. The prime minister's use of the words of "almost certainly" leaves the door open to a longer extension. The Guardian even reported EU officials were exploring the possibility of delaying Brexit until 2021. Any delay would seek to give May more time to negotiate a deal that would be palatable to a majority of MPs. A longer delay, however, would risk giving the opposition time to gain traction in its nascent plans for a second EU referendum. 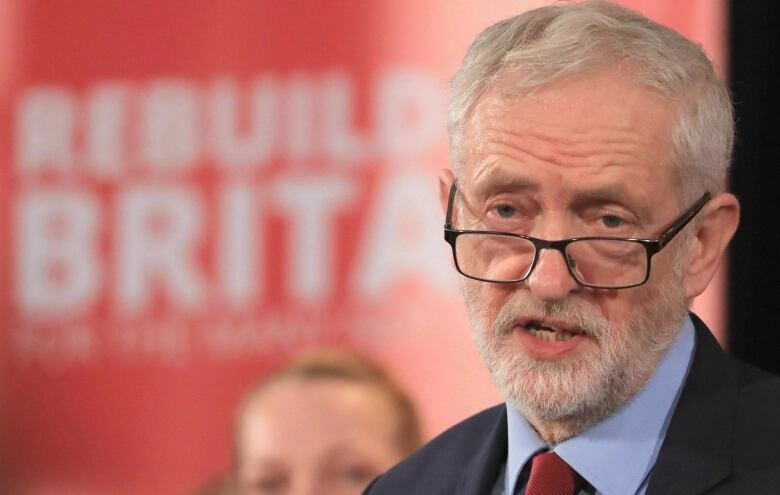 Labour Party Leader Jeremy Corbyn announced plans Monday to back a second public vote as a last resort to prevent a "damaging Tory Brexit being forced on the country." The prospect of a new plebiscite — likely with remaining in the EU as an option on the ballot — could be too tantalizing for Europhile MPs on both sides of the aisle to reject. The end result could see Brexit delayed at first, then cancelled altogether. But that's still several steps away. The U.K. represents one of Canada's top trading and security partners. Since the Second World War, Canada and the United States have leaned on Britain as a key ally in exerting influence among its European neighbours. Now, Britons are giving up their seat at the EU table. It will mean losing their voice during important decisions on Europe's economy and security issues. As it stands, the U.K. risks leaving without a deal and suffering immediate consequences, such as delays in overseas trade, new tariffs and long lineups at ports of entry. Britain is the world's fifth-largest economy, and any Brexit-related hit to its international trade could send shockwaves throughout the planet. What is the 'Brexit backstop'? The top search term among Canadians related to Brexit is "Brexit backstop." So, what is that, anyway? The backstop is a series of measures intended as an insurance policy to prevent a physical border between Northern Ireland, which is part of the U.K., and the Republic of Ireland, an EU member state. Years of sectarian violence known as the Troubles led the U.K. and Ireland to forge the Good Friday Agreement in 1998, which removed border checks on the island. But Brexit means the land frontier will soon separate the EU from a non-member state. And that raises a series of challenges related to the flow of goods that meet EU standards, and those that don't. The backstop is only meant to come into force if the Brexit transition period (laid out in a divorce deal) ends before the U.K. reaches a trade deal with the EU. That wouldn't happen until the end of 2020, at the earliest. If ever the backstop did come into effect, the U.K. would continue to follow European customs rules. Brexit supporters fear that could be the EU's way of keeping Britain in its orbit for years after the supposed breakup. It could also prevent the U.K. from striking its own trade deals with countries such as Canada and the U.S. The next key votes in the House of Commons, expected March 12-14, could finally give Britons some clarity as to where their country is headed and when. MPs have repeatedly rejected plans and amendments put to votes, without a majority ever agreeing on what form of Brexit parliamentarians really want. The uncertainty is not only tearing the country apart, but splitting the political parties who are supposed to present visions for the road ahead. Eleven MPs recently quit the Labour and Conservative parties to form the new pro-European Independent Group, all of whom were unhappy with the direction their parties were taking. Donald Tusk, the president of the European Council — the body representing the leaders of EU member states — said this week delaying Brexit would be the only "rational solution." What's unclear is whether a majority of British MPs now agree with him. "Leave" voters were sold on the promise Britain would easily "take back control" of its borders, money and laws. More than two and a half years of frenzied debate has demonstrated it's harder than it was first thought. Historical considerations and a lack of overall agreement still stand between Britain and Brexit. Conservative Party infighting over the EU — which led then-prime minister David Cameron to call the public vote in the first place — rages on. And Britons remain as divided and confused as on the day of the referendum. As Brexit complications have become clear, opinion polls suggest a slow but steady shift in attitudes, with a majority of Britons apparently now in favour of remaining in the EU. But even if the referendum were rerun, there's no guarantee Brexit would be cancelled. The "Leave" vote represented a gut reaction to a feeling in disenfranchised industrial towns that Brussels bureaucrats did nothing to help the average Briton. That sentiment still exists and has been compounded by increasing anger aimed at London. Those same voters now see their own elected officials endlessly wrestling over how to enact the apparent will of the people. Even in Britain, nearly everyone has a hard time understanding this convoluted process. Some clarity may finally be on the way.